One of my pet peeves with Paul Krugman is his constant rewriting of history, a rewriting that just happens to coincide with left-wing political talking points. For example, we hear that the Great Depression occurred because Herbert Hoover was a staunch believer in laissez-faire and took the advice of Treasury Secretary Andrew Mellon, who called for liquidation of bad assets to “purge” the economy of whatever was “rotten” in the system. Thus, he takes issue with a paper by Alberto F. Alesina and Silvia Ardagna in which the authors claim that tax cuts, as opposed to increases in government spending, provide a better “stimulus” for a moribund economy. Of course, the issue at hand ultimately is not “stimulus” at all; it is the presence of malinvestments, which must be liquidated in order for the economy to recover. the record of Japan’s expansionary policy during its decade-long recession of the 1990s. Let me begin with the “liquidity trap” arguments. The Keynesians are here misled by their superficial treatment of the interest rate as simply the price of loan contracts. The crucial interest rate, as we have indicated, is the natural rate — the “profit spread” on the market. Since loans are simply a form of investment, the rate on loans is but a pale reflection of the natural rate. Keep in mind that Keynesians hold that “real rates” don’t mean much, just as Keynes advocated inflation to cut real wages as a means to increase employment. His response was to declare that workers are only interested “in their money wage.” History tells us something different, does it not? They use a statistical method to identify fiscal expansions — trying to identify large changes in the structural balance. But how well does that technique work? When I want to think about Japan, I go to the work of Adam Posen, who tells me that Japan’s only really serious stimulus plan came in 1995. So I turn to the appendix table in Alesina/Ardagna, and find that 1995 isn’t there — whereas 2005 and 2007, which I’ve never heard of as stimulus years, are. However, as Doug French recently wrote, the Japanese government took a number of spending and interest-rate-cutting actions during the 1990s, none of which worked. True to form, Krugman claimed several years ago that had Japan’s government not engaged in such actions, the Japanese economy would have fallen into depression — this is another of the “Heads I win, tails you lose” propositions we often see from Krugman. For a brief moment in 1990, the Japanese stock market was bigger than the US market. The Nikkei-225 reached a peak of 38,916 in December of 1989 with a price-earnings ratio of around 80 times. At the bubble’s height, the capitalised value of the Tokyo Stock Exchange stood at 42 per cent of the entire world’s stock-market value and Japanese real estate accounted for half the value of all land on earth, while only representing less than 3 per cent of the total area. In 1989 all of Japan’s real estate was valued at US$24 trillion which was four times the value of all real estate in the United States, despite Japan having just half the population and 60 per cent of US GDP. 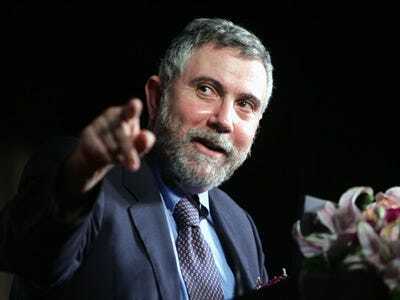 Bubbles, as we have seen, result from deliberate “expansionary” policies by government authorities, yet Krugman always seems to treat them as being solely the products of private enterprise. It never occurs to him that the policies of high leverage and of gambling on inflated asset values would not happen systematically if government were not acting behind the scenes. Instead, he tells us that the only thing that can rescue a financial system is a new round of government regulations.